Add your own content, post articles, comment or check the calendar for latest events in art and subculture. 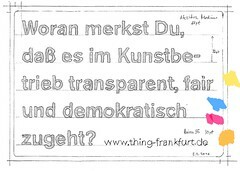 Browse our archive of art, music and other cultural activities outside galleries and institutions in Frankfurt/Main. Join our mailinglist of daily information and exchange.